The VAXstation 4000/60, code named PMariah, is the successor to the VAXstation 3100m76, about 60% faster with its 55.5MHz (18 nanosecond) Mariah processor with 256KB of L2 cache. This machine is quite unusual as, unlike most other VAX systems, its case is not made of steel but of plastic, which makes it one of the least heavy VAX systems. 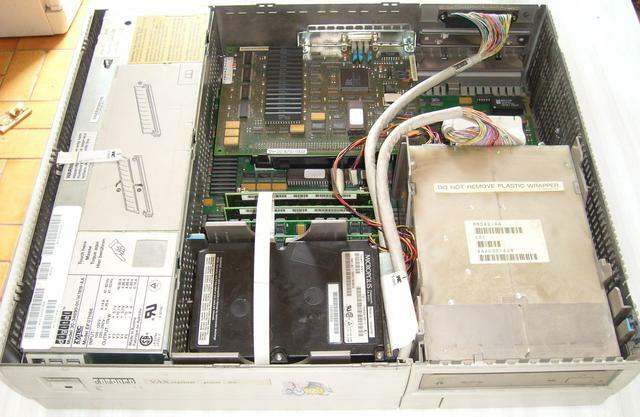 Although the VAXstation 4000/60 was introduced before the VAXstation 4000/90, the local VAXstation 4000/90 page was written first and already describes the connectors of these machines. This is what an opened VAXstation 4000/60 looks like: quite similar to a VAXstation 4000/90, maybe with a different frame buffer. 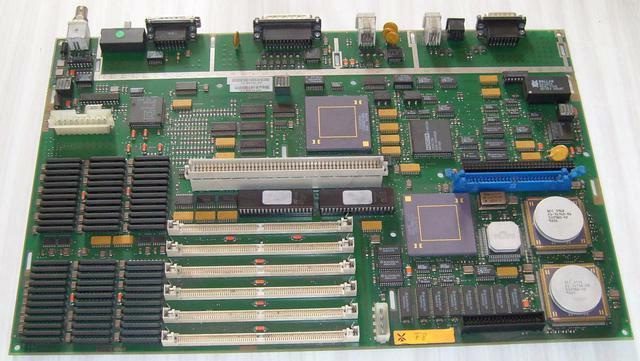 Connectors and daughterboard are identical to their VAXstation 4000/90 counterparts; the following pictures only describe parts which differ between the two machines: motherboard and frame buffer cards. 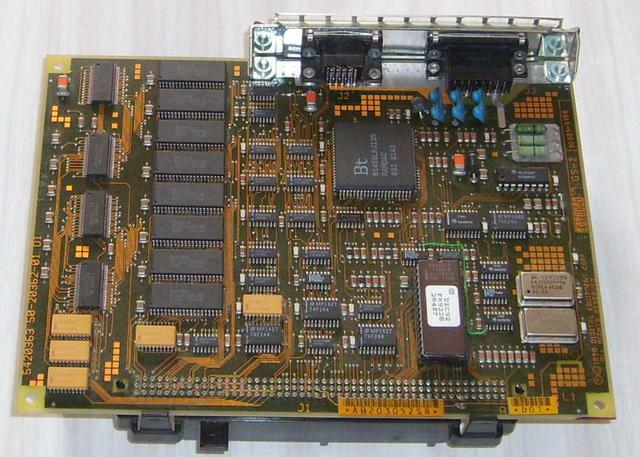 The motherboard is slightly different from the VAXstation 4000/90 motherboard. 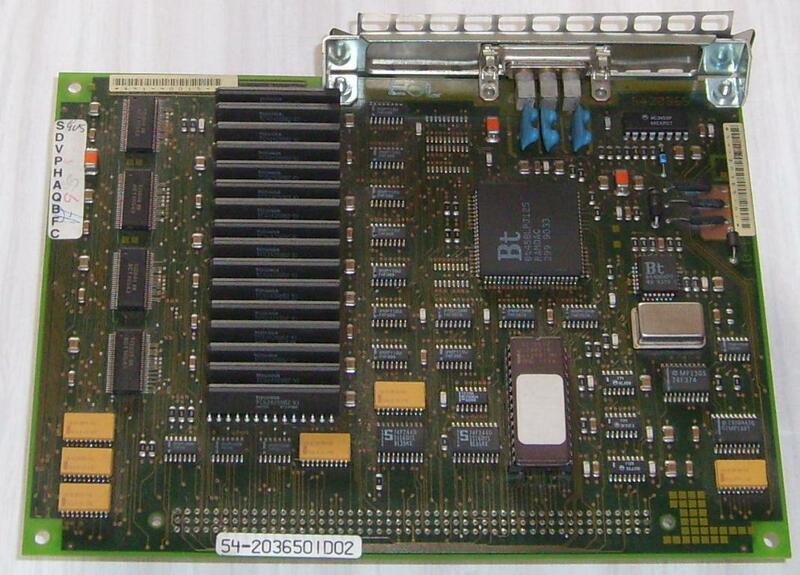 It has 8MB of memory onboard, in the lower left corner, and only six memory slots (with memory set in pairs). The white connector in the middle is the frame buffer connector. Over its right half, one can only see the rightmost edge of the black TURBOchannel option connector. The TURBOchannel option board connects there, and provides a TURBOchannel slot facing the option slot in the back of the enclosure. On the right, over the processor which is split into three chips (the three chips on the right side with circle-shaped heatsinks), the blue connector is the internal SCSI connector, and the black connector next to it accepts the synchronous serial port DSW21 option. Here is a closer look at the LCG default frame buffer option. Here is another LCG card. This one has a lower 1024x768 resolution, and instead of the regular 3W3 connector, sports both a VGA-compatible HD15 connector (in the middle) and a VAXstation 3100-compatible male DE15 connector (to the right).